If you’ve been trying to reach out to loved ones in Puerto Plata but are hindered by the high cost of international calls, we have the solution. 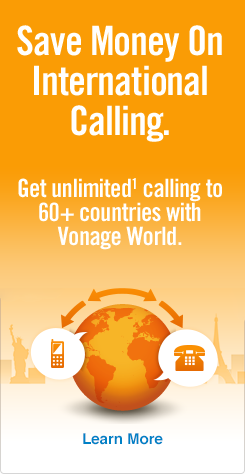 Unlimited¹ calling to Puerto Plata is available now through Vonage World Plus Latin America 100. It’s the plan that can make calling Puerto Plata from USA a delight instead of a chore. No more complicated calling cards. No more shockingly high bills from shady long distance providers. Just plain, simple cheap calls to Puerto Plata. For a low monthly fee, Vonage World Plus Latin America 100 provides unlimited¹ calls to Puerto Plata landlines. While the plan works great for calling back home to the Dominican Republic, it’s just as convenient for other areas too. You’ll also get those same unlimited¹ calls to landlines in the US, Canada, Puerto Rico and over 60 other countries, 8 of which are located in Latin America. We won’t tie you down to only landlines, though. If you need to connect to your loved ones on their cell phones, we went ahead and included 100 minutes to any mobile in Puerto Plata. Once those 100 minutes are used, you can still reach Puerto Plata mobiles for just a small per-minute rate. Even better, if you know someone in Puerto Plata who also has a Vonage plan, you can talk for free! So go ahead and try out our Latin America calling plan. The cheapest way to call to Puerto Plata is here. Next, enter 809 — the Puerto Plata area code, part of the North American Numbering Plan. Other area codes in the Dominican Republic include 829 and 849. To dial other major cities besides Puerto Plata, read up on how to call the Dominican Republic from the US! Now that you have the lowdown on cheap calls to Puerto Plata, read on for some more information on the city. Puerto Plata’s full name is “San Felipe de Puerto Plata,” and while the name may have been shortened, this city is definitely not short on fun. It’s a resort town with numerous hotels and ports for incoming tourist vessels, but the people who live there are just as likely to work in the agricultural business, a major economic contributor thanks to the region’s tropical climate. So pay a visit to the largest city in the north of the Dominican Republic. You won’t regret it.